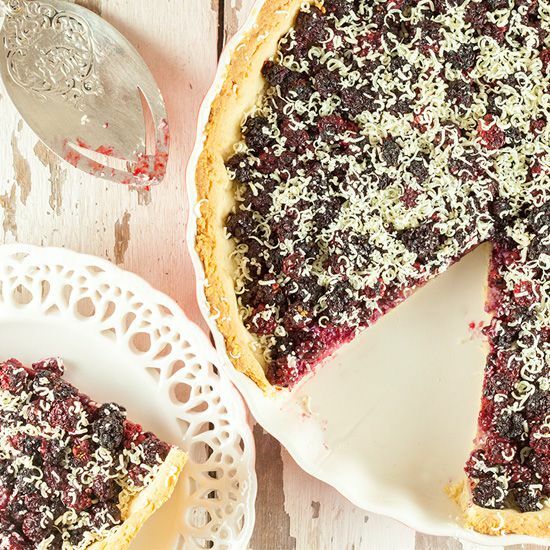 Add almonds and white chocolate to your wild blackberry pie for extra deliciousness. Go on a trip to the forest and get yourself some lovely blackberries! *Note: you can also buy blanched almonds and ground them using a food processor. Start preparing the pie crust. COMBINE the flour, half of the ground almonds, salt and 80 gram sugar. CUT the cold butter into cubes and add it one by one to the flour mix. Keep on kneading until a dough ball forms. WRAP the dough in cling film and place in the refrigerator for about an hour. COAT the pie form with butter using the silicone kitchen brush. PRE-HEAT the oven to 190 degrees celsius or 375 degrees fahrenheit. RINSE the blackberries with cold water. DUST the work surface with flour and roll out the dough using the rolling-pin. TRANSFER the dough to the pie form and evenly divide the dough into the form. The dough is very soft, so it’s possible it will break during the transfer. That’s okay, just press it with your fingers into the form. DIVIDE the other half of the ground almonds on top of the dough. 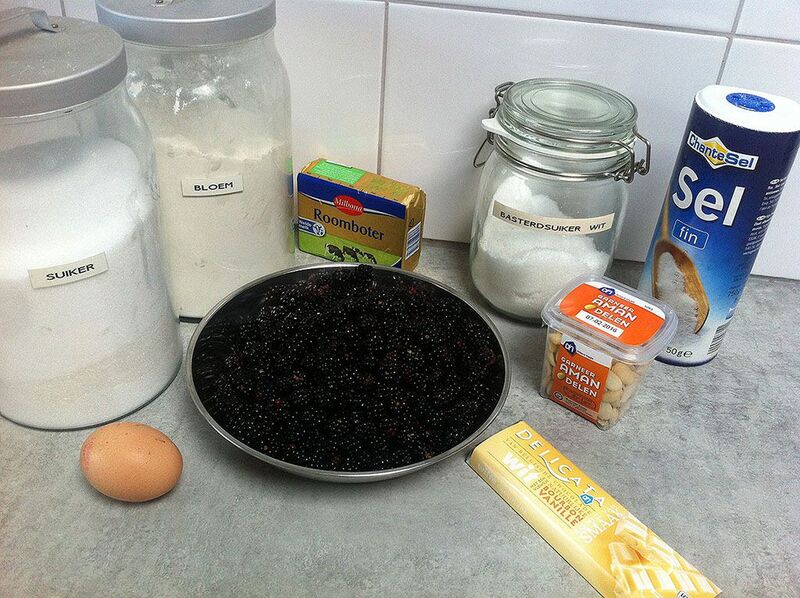 Then divide the blackberries and 1 tablespoon of sugar, the pie is ready to go in the oven now! BAKE the pie for about 20 minutes, depending on the oven you’re using. The crust should be golden brown and the blackberries start to pop. 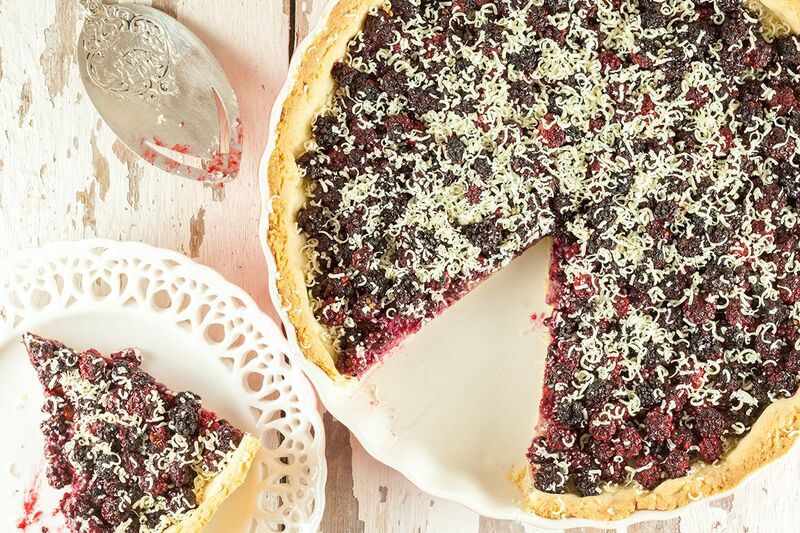 Let the pie cool off before garnishing with grated white chocolate. Enjoy!